Whether you are dealing with trading systems and trading strategies, market analysis, or the holy grail of market indicators, the amount of information surrounding futures and forex trading available to traders is impassable. However, there is one topic that is often overlooked by traders that could potentially result in better risk mitigation and higher profits. Of course, we are talking about the topic of how to manage a futures or forex trading account. In the trading industry, trade management and risk mitigation are far from the most popular topics, however, both are essential components in helping both new and experienced traders alike improve the chances of maintaining their investment portfolios. If you have been in the industry for a while, you more than likely have heard the term ‘position sizing’ before. But what exactly does it mean? Position sizing refers to the number of units invested in a particular security by a trader or an investor. Position sizing is utilized by investors to help identify how many units of a security they can purchase, which helps them to control risk and maximize returns. Position sizing, in short, is an effective money management technique where only a certain percentage of the total trading account is at risk for each individual trade. Position sizing is different from other portfolio management techniques. It focuses on the preservation of trading accounts as well as the psychology of trading. Applying a set of reactionary rules prior to entering the market can markedly reduce the risk of a major profit loss should the market turn against a position. When the market shifts in the opposite direction of a trade, traders and investors can gain peace of mind in knowing that the losses will only be a fraction of their total trading portfolio. Tom is a conservative trader enduring by his own position sizing rules. Per set rules, he is only going to risk two percent (2%) of his total account per trade. With a trading account size totaling $25,000, he will be putting $250 per trade at risk. When trading one contract of the S&P 500 (ES), which trades at $15.00 per tick, or $60 per point, Tom places his stop loss at 18 ticks away from the entry price (18 x $15.00 = $270). Employing a 1:1 risk to reward ratio, Tom places his profit target 18 ticks on the opposite side of his market entry. A more popular approach might be a 2:1 risk reward ratio where a stop loss and profit target is placed at 18 and 36 ticks on each side of the entry price. Should Tom feel that 19-tick moves within the S&P 500 are not attainable, increasing the contracts to three would still allow him to follow his two percent risk measure and place his stop-loss only nine ticks away from his entry with a profit target of 18 ticks. AlphaDroid’s trade management tools offer traders an automatic and visual method to identify stop-loss and profit target placement quickly using user-defined ratios. Once traders using have defined entry and exit levels, AlphaDoir’s algorithmic trading strategies help automate order submission and portfolio management, allowing traders to stick to their predetermined rules and risk tolerance instructions associated with the position sizing method. 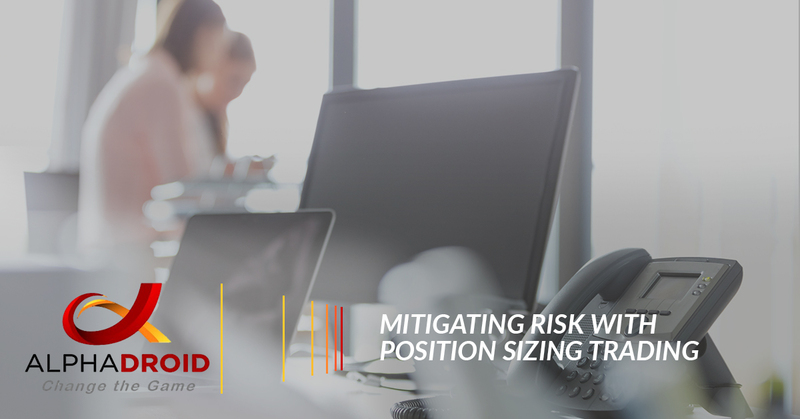 Regardless of the trading strategy used, indicators or approach, mitigating risk is essential to the preservation of your capital and the longevity of your trading account. The principle discussed above is just one of the many strategies that can be used to manage risk, and while this method may not fit the unique needs and style of every trader or investor, the key to success is having a plan and sticking to it. If you are interested in learning more about AlphaDroid’s algo trading strategies and how they can help you mitigate risk and increase profit returns in your investment portfolios, contact us or try a Free Trial of AlphaDroid today!